The tagline of Communis Hostis Omnium, “Navigating the Murky Legal Waters of Maritime Piracy,” is perfectly apt for describing the nature of piracy law. Even apart from the deft water metaphor, the tagline rightly points out that the nature of the law surrounding the oldest international crime is both unsettled and uncertain. One of the thorniest doctrinal issues pertaining to piracy law is the question of whether facilitators of piracy must be physically present on the high seas to avail themselves to universal jurisdiction prosecutions. Much attention has been paid to the subject both on the pages of this blog and others. 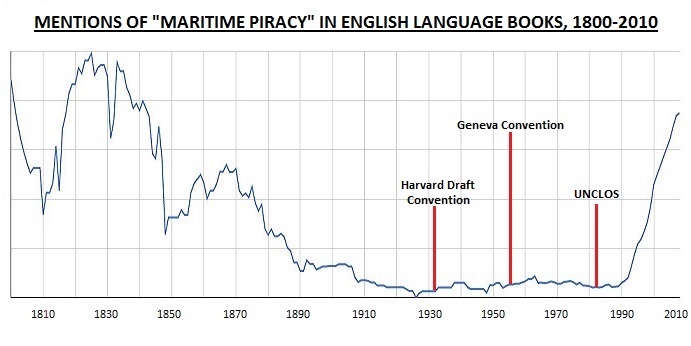 While working on a law review article on the subject, I generated this graph, which should give every international lawyer pause when considering the state of modern piracy law. I created the graph above using Google Ngram, which is a tool that allows users to view a given word or phrase as a proportion of all words and phrases in the 20 million books scanned by Google to date. Rarely do numerical data paint such a clear picture. In short, piracy was of great import up until the turn of the twentieth century, where it was subsequent relegated to the backburner, not to be revived until the turn of the twenty-first century. Presumably, international lawyers and the general public perceived this trend in a similar fashion, so the fact that all of the modern positive international law dealing with piracy was drafted during piracy’s wane should have a humbling effect. There is a significant chance that the drafters of UNCLOS and others who played a role in shaping the customary international law vis-à-vis maritime piracy saw piracy as more of a theoretical issue than a practical one. That fact should, in and of itself, play into the contemporary analysis. This is not to say that the graph above proves anything one way or the other as far as a high seas requirement for facilitators is concerned. Rather, it is meant merely as food for thought to start your week by. We are dealing with an issue whose renaissance was not predicted by many – if any – scholars or practitioners of international law. What to do with that fact is an open question but one that should undoubtedly be taken seriously.